This morning I was sat in the car waiting for a while before going to meet someone at 9am. I briefly closed my eyes and simply said “Father.” It was like a wave washed over me, a fresh consciousness of Jesus within. What a wonderful thing to happen just before going to meet someone! It’s a reminder. We have been praying this simple prayer for a while now, “Father, reveal your Son in me today.” We’ve been asking him to do so throughout the day. That is his delight to do. As we ask him to do that, he responds and reveals Jesus in us afresh. But today I realised we don’t even have to say all of that! There is something about the way we say “Father” that means we are praying that prayer. In fact, the way we say “Father” is the revealing of his Son in us, to us. The moment we say “Father” in such a way, Jesus is revealed in us afresh. This is not a cry for help, or of desperation, but a cry of oneness. It is a cry of thankfulness that we are one with Jesus and one with our Father. It is a cry of joy from the Spirit of the Son in us to the Father. And it is a cry of joy from us to “Our Father.” When we are saying “Father” in that way, we are praying that prayer and Father WILL answer. It’s very simple isn’t it. We say, “Father.” He reveals his Son in us afresh. In revealing his son in us, he confirms that we too are sons. He is saying in reply to you and I, “Son.” Now we know beyond any doubt that Jesus himself is within us. We know that the Life is at work in us, being Life to us in spirit, soul, mind and body. And we know that this Life is flowing from us, being Life to others too. Perhaps it seems too simple? Surely we have to ask for more? Surely there is much more we have to say? No, it is this simple. When we pray this one word prayer, “Father,” we are conscious of the gift within us, Jesus himself, the one who is all. We are conscious that all we need is in him, in us. This is simplicity. To simplify EVERYTHING until all we have is Jesus. And this is simplicity. Just as Jesus says “Father,” so can we. And we know we have everything in Christ in us. Truly excellent. 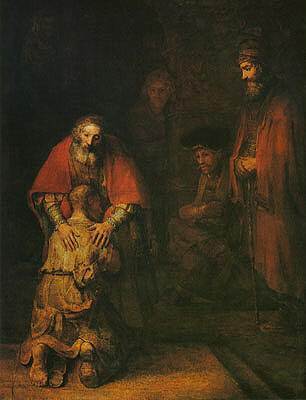 Not the prodigal son but the Amazing Father.